Last weekend after brunch at the Backbencher, a gastropub across the from the Beehive, friends and I headed over to take the tour through New Zealand’s parliamentary buildings. 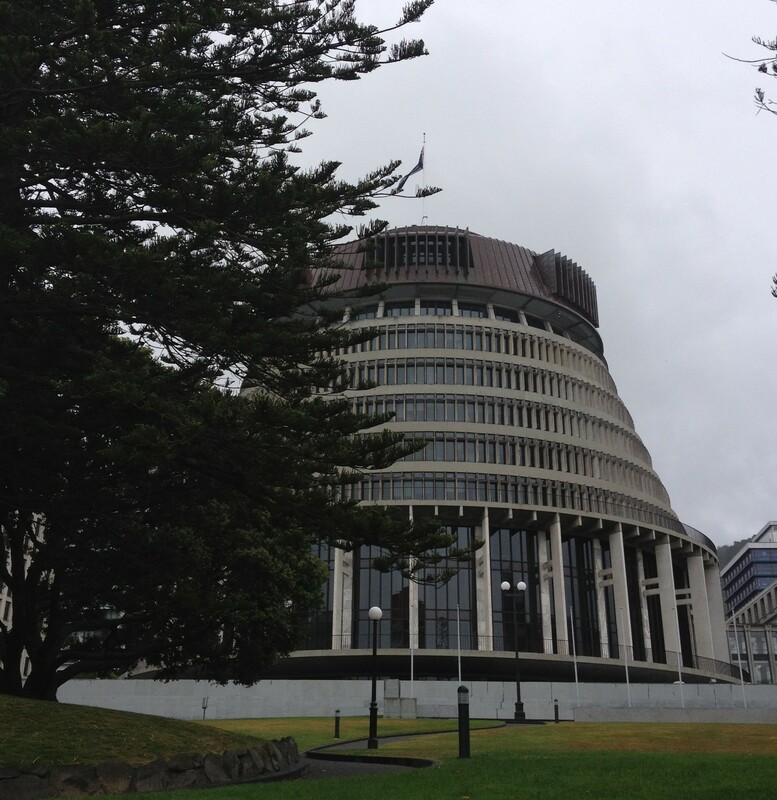 The Beehive is the common name for the Executive Wing of the New Zealand Parliament Buildings, located at the corner of Molesworth Street and Lambton Quay, Wellington. Bet you can’t guess why it’s called the Beehive. •	The building is ten stories (72 m) high and has four floors below ground. The entrance foyer’s core is decorated with marble floors, stainless steel mesh wall panels, and a translucent glass ceiling. •	The Beehive’s brown roof is constructed from 20 tonnes of hand-welted and seamed copper. It has developed a naturally weathered appearance. •	A tunnel leads from the building under Bowen Street, linking the Beehive with parliamentary offices in Bowen House, which were built expressly to house MPs during the Parliament strengthening works that took place from 1992 – 1995. •	The Beehive is extensively decorated with New Zealand art. •	An extension has been built out the front to allow for a new security entrance. A new, bomb-proof mail delivery room has been built at the rear of the building. Anyway the tour was interesting and we saw around Parliament house, including the debating chamber and where the Prime Minister sits (4th seat from the speaker, 2nd row in – before microphone were used, it was the best place in the room acoustically), Parliament Library and a couple of rooms inside the Beehive. However, for my money (not that we actually paid for this tour) the best thing was seeing the earthquake strengthening they did in 1992 – 1995. The mapped Wellington fault line is actually only 400m from Parliament, basically running along Tinakori Road to the east. A Geological Survey showed that the fault had not moved for 350 years and so the likelihood of it doing so was predicted at 10% to 50% in the next 150 years. In order to protect the heritage listed buildings from earthquake damage up to 7.5 on the Richter scale, they actually separated Parliament House and the Parliament Library from their concrete foundations and added a base isolation system; the ground will keep on shaking, but due to the installation of base isolators, the tremors are isolated in the foundations and do not travel up into the building (or only do so in a much reduced manner). 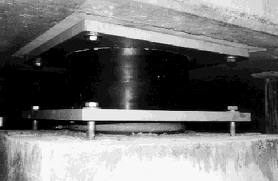 The base isolators consist of alternate layers of high density rubber and steel plates, surrounding an inner core of lead and are designed to move up to 30cm in any horizontal direction during a quake up to 7.5 on the Richter scale. Each base isolator can stand a vertical weight of over 150 tonnes. More than 400 bearing were placed into load bearing locations. During installation flat jacks were filled with an epoxy grout to place the bearings under pressure to support the weight of the building above. A cylindrical hole was then cut through the original foundations to allow access for a hydraulic arm with a large horizontal saw attached. These saw cuts removed slices of the original foundations, leaving a 20mm seismic gap separating the building from its base, and the entire structure resting on the base isolators. The building is resting on these “shock absorbers”, which both absorb and move with an earthquake, but is designed not to pass this seismic activity up into the buildings above. Unfortunately I can’t tell you as much about the “suicide squad” responsible for abolishing the Upper House, the NZ constitutional monarchy or the mixed member proportional representation (MMP) voting system. Still it was definitely a tour worth doing, and I have come away with a new found respect for modern engineering.